The president’s address signaled his plans for domestic austerity and military bloat. 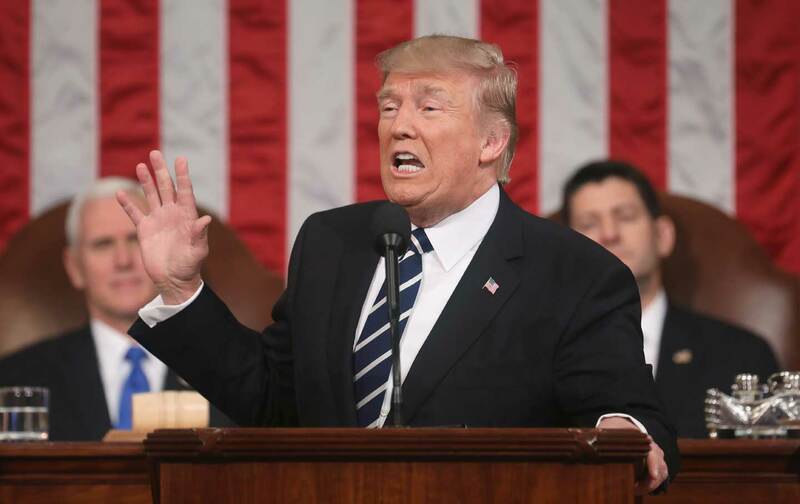 Donald Trump used his first Joint Address to the Congress of the United States to engage in an unprecedented flight of fiscal fantasy. Specifically, the president imagined that the United States could cut taxes for wealthy Americans and corporations, rip tens of billions of dollars out of domestic programs (and diplomacy), hand that money over to the military-industrial complex, and somehow remain a functional and genuinely strong nation. Trump was brought little precision to the task of explaining how he would pay for that increase—aside from mentioning the fact that he had “placed a hiring freeze on non-military and non-essential Federal workers.” But his administration has been very clear about its hope that the money will come from deep cuts to domestic programs. This argument in favor of austerity for working families and munificence for military contractors (the president’s speech actually talked up Lockheed and “the fantastic new F-35 jet fighter”) is not exactly new. It has been a conservative mantra since the Grand Old Party purged itself of the “Modern Republicans” who clung to the vision of former President Dwight Eisenhower and made theirs a party of reaction rather than reason. But even Ronald Reagan and George W. Bush eschewed the budgetary extremism that Trump has embraced with an immediacy and a fervor that arrests any fantasy that a “billionaire populist” president might steer his adopted party back from the brink. The “Budget Blueprint” that Trump took to Congress on Tuesday night did not plot a course to “make America great again.” It tipped the balance against greatness by making what the first Republican president, Abraham Lincoln, referred to as “the last best hope of earth” into an ever more heavily militarized state that will not care for its own. This is not an accidental turn. This is by design. But it is not a grand design; rather, it is an approach that Trump has adopted as he has moved from the capricious politics of his initial candidacy to the reality of a ever more rigidly right-wing presidency. Yes, of course, Trump bounced all over the ideological landscape during the 2016 campaign, and his presidency hasn’t exactly been a model of consistency. Mulvaney was unsettlingly vague when asked about keeping Trump’s promise to guard against Social Security cuts. But he was clear about the general thrust of the administration’s approach to budgeting. Mulvaney is wrong. That’s not a win. That does not protect America—at least not in the sense that Democratic and Republican presidents have historically understood the preservation of the republic. Budgeting is always a matter of striking balances. And when there is an imbalance, the American experiment is threatened. Dwight Eisenhower explained this when he appeared barely two months into his presidency before the American Society of Newspaper Editors. The speech was much anticipated. Eisenhower was the first Republican commander in chief in two decades, and he was still placing his imprint on the Oval Office, the country and a world that was in the grips of a “Cold War.” The new president could have chosen any topic for his first major address to the assembled media luminaries. He chose as his topic the proper balancing of budget priorities. This world in arms is not spending money alone. It is spending the sweat of its laborers, the genius of its scientists, the hopes of its children. The cost of one modern heavy bomber is this: a modern brick school in more than 30 cities. It is two electric power plants, each serving a town of 60,000 population. It is two fine, fully equipped hospitals. It is some 50 miles of concrete highway. We pay for a single fighter with a half million bushels of wheat. We pay for a single destroyer with new homes that could have housed more than 8,000 people. This, I repeat, is the best way of life to be found on the road the world has been taking. This is not a way of life at all, in any true sense. Under the cloud of threatening war, it is humanity hanging from a cross of iron. Eisenhower did not propose surrender or immediate disarmament. But he did propose diplomacy (“We welcome every honest act of peace”), and the sincere pursuit of a world with fewer weapons and fewer excuses for war making (“This we do know: a world that begins to witness the rebirth of trust among nations can find its way to a peace that is neither partial nor punitive”). These are different times. The world has changed, and so has the United States. But what has changed the most is the understanding that providing for the common defense does not preclude the promotion of the general welfare. On a planet where Americans account for 4.34 percent of the population, US military spending accounts for 37 percent of the global total. And Trump—with Mulvaney’s assistance—appears to be determined to move the latter percentage upward.